There is absolutely no reason why kosher food and desserts have to be anything less than what everyone else is eating. Share with me your baking and cooking sucesses, challenges, and disasters. 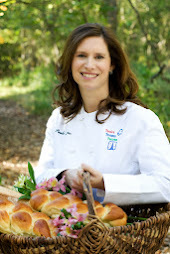 I will share my recipes, shabbat and holiday menu planning and my love of food. A few months ago, I received an email from Brochi, of the Chabad of Sea Gate synagogue, Brooklyn, asking me to do a baking demonstration. She had heard about me from the national Chabad network. Sea Gate is a small gated community at the end of Coney Island in New York and is where my mother grew up. I called Brochi and asked her whether they were located at 3844 Lyme Avenue and, with great surprise, she said, "Yes." That was the home of my grandparents. I knew that it was Chabad house as the rabbi had officiated at my grandmother's funeral when she died at the age of 98 after a long life of lemon sponge cake. Brochi couldn't believe that the person she wanted for the cooking class was the granddaughter of the Altman family she had heard so much about from the old timers. Last week I returned to my grandmother's kitchen and taught a class in the very kitchen where my grandmother first introduced me to delicious homemade desserts. 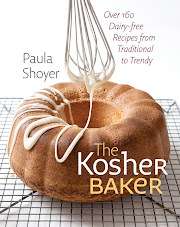 The Kosher Baker is dedicated to her memory and contains some of her recipes. The kitchen is now larger and modern, unlike grandma's fuchsia and marigold 1970's design, but much of the house is the same (though it appeared smaller to my older self). A marble mantel by the window in the dining room is the same, and a framed photo of Rabbi Schneerson, z"l, the revered Lubavitcher Rebbe, now occupies the spot where grandma placed her giant apple pie every Thanksgiving. Grandpa Joe, a pillar of the Sea Gate Jewish community, would have liked that. The cooking class was extraordinary and attended by over 45 women, including my mother and aunt who grew up in the house and my daughter Emily who had never been there before. My mother was quite emotional being back in her childhood home, but enjoyed remembering her idyllic life growing up there. Some of the women had connections to my family. I served a healthy fish dinner followed by my 6-layer chocolate ganache layer cake that was as tall as grandma's famous yeast cake. I expected to be overwhelmed with emotion. Instead, I felt surprisingly calm, happy and at peace; it was the most natural thing in the world to be back there after 24 years. Only later when writing about the experience did I fully appreciate the moment and got teary that it was over. I emailed the Chabad and asked if I could return next year. When I described my experience to my friend Limor, she said I sounded like Oprah and sent me to the "love letter" that Oprah read to her audience on her final show. Oprah talked about how everyone has a "calling" and your job in life is to figure out what that is and get about the business of doing it. She said, "A calling lights you up and lets you know that you're exactly where you are supposed to be, doing exactly what you're supposed to be doing." That is how I felt back in grandma's kitchen. Oprah described a "spark" that ignites you. 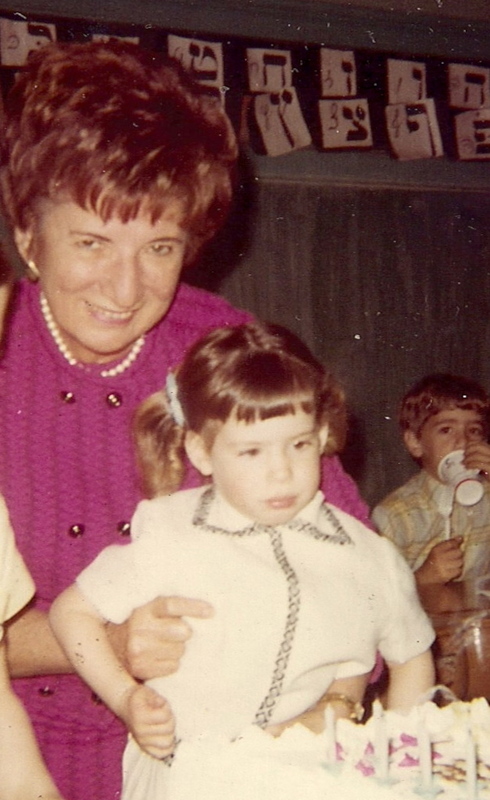 My spark came from the hours I watched grandma cook and bake, never complaining about all the steps demanded by her stuffed cabbage, tiny Swedish meatballs or blintzes. Of course I did not recognize the spark at the time; I had to go out into the world and try other careers first. But ultimately I came right back to where I started. Oprah's wish for her audience was that once they know what sparks the light in them, they should then go out and illuminate the world. I only wrote a cookbook, but I know that by doing so I have spread joy in the world and look forward to continuing to do so. I often hear from young brides that my book has connected them to their grandmothers' baking traditions. By writing The Kosher Baker, I have become the Grandma Sylvia to a new generation. I think that is what is meant by the wish: "May her memory be a blessing." The blintz filling is grandma's. When she was 88, she came to visit me in Washington, DC and showed me how to make her blintzes. As she shuffled around my kitchen, I tried to estimate the measurements of her handfuls. Her crepes were so thin you could see through them. I have never been able to get her crepe recipe to work, so I use my French crepe recipe. Wishing you a happy and tasty Shavuot! Place the flour, sugar, salt, oil, milk, eggs and butter into a medium bowl and whisk vigorously. Strain into another bowl, pressing to get out as much batter as possible and then discard solids. Cover and refrigerate for 15 minutes. To prepare the filling, place the cream cheese into a bowl and mash with a fork. Add the farmer cheese and mix well. Add the sugar and egg and mix well. Cover and refrigerate until using. Take parchment or waxed paper and tear into 16 8-inch pieces. Heat an 8-inch non-stick or crepe pan over medium high heat. Brush with a little butter. Lift the pan off the hear, scoop up a little less than 1/4 cup batter and pour into the pan, just above the center, and then turn clockwise 2-3 times to cover the pan with the batter. Add a little more batter to cover any holes. By the third crepe, you will know exactly how much batter you need. Cook for 45 seconds to one minute and when the edges are brown, use a silicone spatula to lift the crepe, turn over and cook 15 seconds more. Turn onto a plate. If the crepe start to brown too fast, turn down the heat. I usually turn down the heat anyway after 5 crepes. Repeat for the rest of the batter and place the parchment or waxed paper pieces in between the crepes. Let cool 15 minutes. To fill the crepes, place one in front of you, the more browned side up. Place about 2 tablespoons filling just above the center and spread about 2 inches wide. Fold the right and left sides 1-2 inches towards the center and press into the filling. Roll up and set aside. You can freeze them at this point and cook later. To cook, heat the oil and butter in a large frying pan over medium heat. Add the blintzes and cook for about two minutes per side or until browned. Serve hot. You can freeze them already cooked with waxed paper pieces between them. This is truly beautiful and I thank you for sharing. Our past is significant to who we are and you had a moment, most of us can't have. So moving...I almost felt I was there. But I would have "gotten teary" almost immediately, I think. And - the blintzes look divine. That's a lovely story-thanks for sharing it. I never fail to be amazed by the influence our grandparents had on us.